Use TB1QMG0 to reference this item. To sread bike awareness in the world! It's a Jeep so it can go anywhere! :-) I hope this coin will travel far away to spread its message, and in the end of 2009 to come to Greece, in Rhodes island, at the cache named "Rodini" (GC12VJQ). Please help it travel! On August 12, 2008, Tod was riding a motorcycle when he was killed in an accident caused by a left turning vehicle. Tod was the third member of Team Rod & Tod w/KAboom. 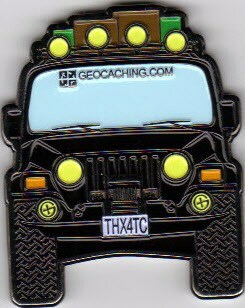 This Jeep geocoin, is released in his memory and in memory of all motorcyclists killed on the road! V keši není :-( a koukám, že asi dlouho ne. Viděn na eventu Zvonění na Ježíška. Díky. Viděno na eventu Zvonění na Ježíška 2013 v ČB.